MassRoots’ volatile autumn is wrapping with the firm facing eviction from its Lower Downtown Denver office space. The company hasn’t paid rent since August for its second-floor office at Market Center, 1624 Market St., according to a notice taped on the locked, glass doors. 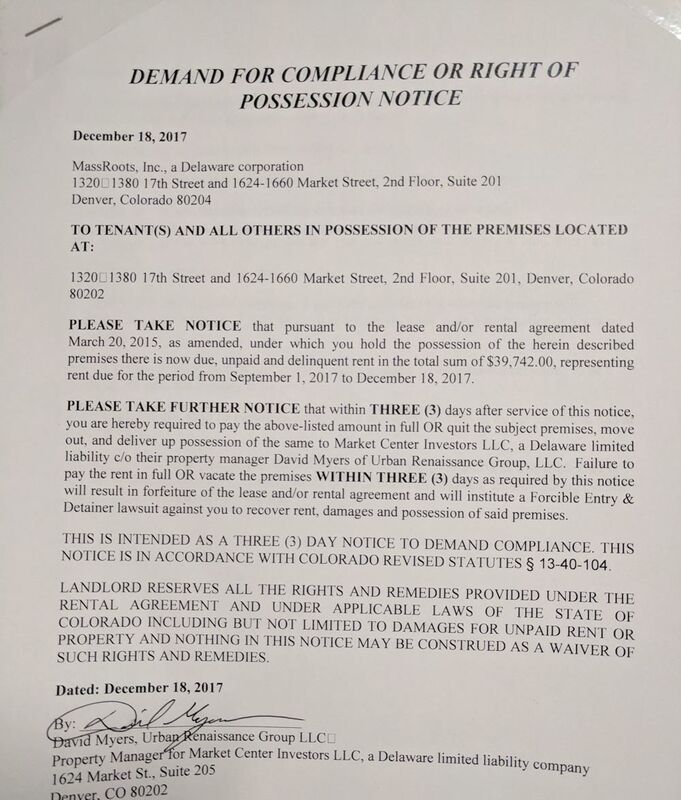 If MassRoots doesn’t pay $39,742 by Thursday, the company will be evicted from the office that has served as its headquarters since 2015, according to the Dec. 18 notice from Urban Renaissance Group LLC, the property manager for building owner Market Center Investors LLC. David Myers, senior property manager for Urban Renaissance, could not be reached Wednesday for comment. MassRoots leased the 3,552-square-foot office in March 2015, regulatory filings show. In January 2016, it expanded into a neighboring suite, adding 1,508 square feet, according to the company’s most recent annual filing, made March 31, 2017, with the U.S. Securities and Exchange Commission. On Wednesday, MassRoots’ Market Center offices were empty and dark. Two bundles of letters sat unopened on the floor and FedEx undelivered mail notices were stuck to the door. When reached by The Cannabist Wednesday, MassRoots CEO Isaac Dietrich blamed the company’s leasing woes on a leadership change that occurred in mid-October. At that time, the company’s board of directors ousted founder and CEO Dietrich, replacing him with Scott Kveton, founder of compliance software firm Odava, which MassRoots acquired this summer. Dietrich reclaimed his position as CEO last week. As for the September to mid-October period during which he was still at the helm, Dietrich said MassRoots officials at that time were trying to renegotiate the terms of the lease with the property owner. MassRoots does have funds available to pay the amount owed, Dietrich said, adding that if a payment is not made, it will be a “strategic business decision” to lower expenses. Queries to Kveton were not immediately returned Wednesday. The “Right of Possession Notice” caps a turbulent fall for the publicly traded MassRoots (OTC: MSRT, 29.74 cents). Amid Dietrich’s departure in mid-October, a deal was nixed for MassRoots to acquire Denver-based CannaRegs, which provides a database of cannabis policies and regulations.. In mid-November, MassRoots released its third-quarter financials revealing a quarterly net loss of $7.5 million and revenue hovering around $11,500. Company officials, in the respective SEC filing, disclosed a need to raise at least $2.5 million during the fourth quarter to be able to continue to fund operations. As November ended, MassRoots and its former CEO traded shots. First, the company sued Dietrich for allegedly violating the terms of his separation agreement, including claims he paid himself more than $250,000 without authorization. Dietrich fired back by making a preliminary proxy filing, indicating plans to appoint a new board of directors and reinstall himself as CEO. On Dec. 14, SEC filings disclosed that Dietrich was reappointed CEO, his three director nominees were named to the board, and Kveton and the existing board members had resigned.